Mubarak told ABC's Christiane Amanpour on February 3, 2011, that Obama "doesn't understand Egyptian culture and what would happen if I step down now." Mubarak accurately warned that if he resigned abruptly, as he was pushed to do that February 11 by Obama and the military in response to protests, bringing to climax the Arab Spring, he would be followed by chaos and rule by the Muslim Brotherhood (MB), which Egypt now rightly calls a terrorist organization. Chaos duly ensued, and the well-organized, deeply entrenched MB and its Salafi allies, after electoral victories, imposed an Islamist agenda on the country, eventually alienating almost the whole citizenry. As Obama told CBS's Steve Kroft during a joint interview with then-outgoing Secretary of State Hillary Clinton broadcast on "60 Minutes" January 27, 2013, at the height of the Islamists' ascendancy, "You know, when it comes to Egypt, I think, had it not been for the leadership we showed, you might have seen a different outcome there." Supporters of Mubarak's successor, Mohamed Morsi, an MB hardliner, launched an armed insurgency when he was deposed on July 3, 2013 after only one year in power. The MB's violent protests will probably not go away, though they are shrinking at least for the moment, while some of the key secular liberal groups that helped bring down both Mubarak and Morsi are turning against the repressive military. Turnout for the new Constitution -- which strips away most of the Islamist provisions found in the previous one, rammed through by Morsi in December 2012, while placing the military leadership beyond civilian control-- was officially a modest 38.6 percent, but with a "Yes" vote of 98.1 percent. In actual numbers, almost 20 million voters backed the document, over eight million more than endorsed Morsi's charter in December 2012, and roughly six million more than had voted for Morsi as president that May. The MB and its Islamist allies, plus a few of the secular liberal groups that had opposed Mubarak, boycotted the vote, denouncing the crackdown on dissent under al-Sisi, a Bizarro World replay of the campaign against Morsi's own Constitution. The 2014 referendum's success enables the widely-expected presidential candidacy of al-Sisi, a modern day pharaoh in a land that has known largely that kind of rule for the past five millennia. Al-Sisi now runs Egypt through competent surrogates like Acting President Adly Mansour and Prime Minister Hazem al-Beblawy, though his glow may dim should he finally shed his uniform and govern directly as a civilian. 3 . EGYPT MAY BE JOINING A NUCLEAR ARMS RACE WITH IRAN WHILE REACHING OUT EVER MORE TO RUSSIA AND PERHAPS CHINA FOR ALTERNATIVES TO U.S. AID. This is happening as the Obama administration implements a toothless nuclear deal with radical Shiite Iran, alienating traditional Sunni allies like Egypt, Saudi Arabia and the United Arab Emirates. In October 2013, Mansour announced a major expansion of Egypt's sixty-year old advanced nuclear program, possibly with help from Russia, with which Cairo signed an alarming $2 billion arms deal in November. 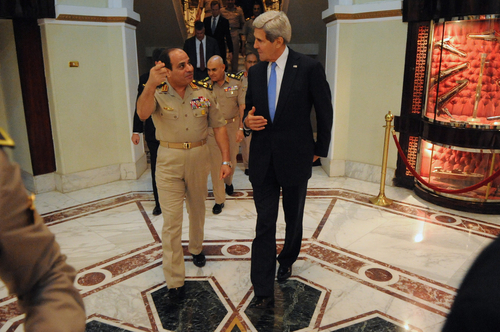 That alliance-shifting switch was prompted by Obama's decision last fall to suspend about a third of the annual $1.6 billion U.S. aid package to Egypt out of pique at al-Sisi's crackdown on the MB, while the White House had increased aid to Morsi when he had muzzled and even murdered his own opposition, angering most Egyptians. To calm these strategically dangerous waters, last week Congress voted to grant $1.52 billion in aid to Egypt for 2014 -- but it is so hedged with conditions that no one can be sure if all or indeed any of it will actually go to Cairo, or assuage a single Egyptian after so many snubs if it does. 4. CHRISTIANS WILL STILL SUFFER BUT MAYBE NOT AS MUCH. Egypt's long-persecuted Christian minority, wrongly blamed and physically targeted in a pogrom by the Islamists after Morsi's fall, will find neither the same level of active persecution, nor -- unfortunately -- much more government protection than it did in the waning days of Mubarak, which were also marred by frequent acts of mayhem against them. Nor will they probably receive any help from the White House, which shamefully has been almost completely silent on the ever-more intense, large-scale violence against Christians throughout the Middle East and Muslim world in recent years. Yet despite the divisions that still wrack the country, we ought to thank al-Sisi and the Egyptian people for ending the reign of the falsely "moderate," militantly anti-Western, anti-Christian, anti-Semitic, anti-female and anti-gay MB, that is allied with Al Qaeda and was using Egypt as a base to spread its influence and ideology. For that service alone, Egypt today would be worth more than every penny it might yet see of the American taxpayers' money--even if we cannot buy a genuine democracy in a land that has never known one.